With easy access to the Internet you can easily find a number of online video converter and software to download to convert MPG to MP4 on Mac devices. While there are plenty of options which can often be cumbersome and result in a low quality conversion. Many free online video converters that convert MPG to MP4 can also be incredibly time consuming. With slow conversion rates and a loss in quality, you may be questioning why you would want to go through the trouble of even converting your MPG to MP4 files. For individuals who regularly use Apple products like a Mac, you may find it difficult to play your MPG on the devices. This is because most Mac computers or laptops widely support MP4 formats instead of MPG formats. MP4 file formats are the most commonly used file formats used when you want to send video over the Internet. If you only have a file that is MPG format, this can be a difficult task. But, you can easily convert your MPG file format to MP4 format on Mac quite simply. By doing this simple process, you can also free up space on your hard drive while still retaining a high quality video format file. While there are a number of free online video conversion website available, most of these will not be the best options to perform your MPG to MP4 file conversion on a Mac. Some may not be compatible with Macs, while others can result in a poor quality file conversion that lacks the original details you started with. You also need to take into consideration that most of these video converters will not compress the file which will take up a large amount of your hard drive space. Wondershare UniConverter (originally Wondershare Video Converter Ultimate) is the best video converter you can find that will easily convert your MPG to MP4 on Mac without a loss of quality and without taking hours to complete. The video conversion process is incredibly simple that even those with little to no experience in file conversion will be able to easily and successfully convert their MPG files to MP4 in no time. The video conversion can be done in just 3 simple steps. Step 1 Launch Wondershare MPG converter and load MPG file. 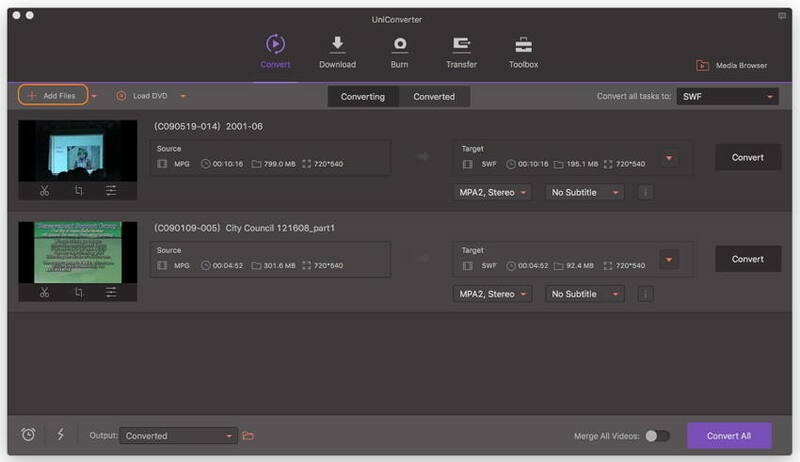 Download, install, and launch Wondershare UniConverter (originally Wondershare Video Converter Ultimate) on your Mac. On the main interface, click Add Files and browse for desired MPG file or use drag and drop to add the file. If you have muliple files, you can convert MPG files to MPG in batch. Step 2 Select MP4 as output format for MPG to MP4 conversion. Once MPG file is added to the software, select MP4 from the output section by clicking the drop-down list beside Convert all tasks to: > Video > MP4 > the resolution. Step 3 Start converting MPG to MP4 on Mac. Click Convert icon to initiate the MPG to MP4 conversion process. If several files should be converted, then click Convert All button to convert files in batch. After a while, the desired MPG file will be successfully converted to MP4 format. You can click the Output icon at the bottom of the main interface to find the converted file. Wondershare UniConverter (originally Wondershare Video Converter Ultimate) is the best MPG to MP4 for Mac video converter available. 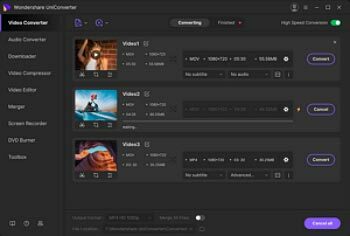 It offers an all-in-one platform to convert, edit, play, organize and much more for your video files. Wondershare UniConverter (originally Wondershare Video Converter Ultimate) provides ultra fast video conversion that can be up to 30 times faster than with any other video convertor. You also will not suffer from any loss in quality with the Wondershare UniConverter (originally Wondershare Video Converter Ultimate) as file conversion retain the details and display at optimal viewing pleasure. 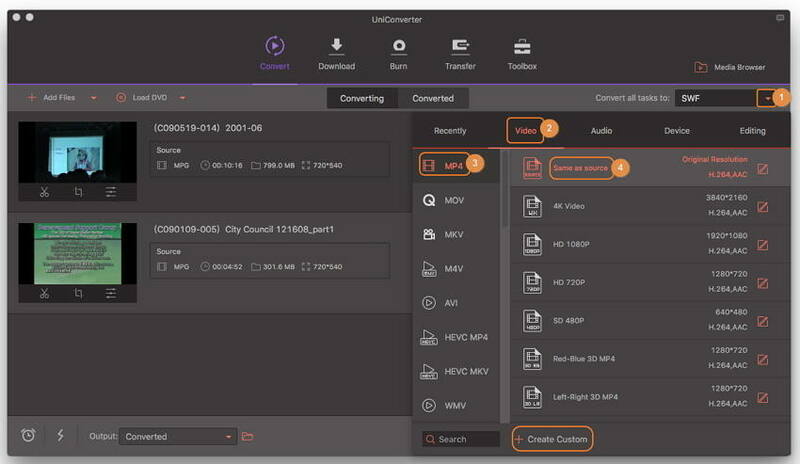 Aside from being able to convert a wide range of video files you can also edit video clips using the Wondershare UniConverter (originally Wondershare Video Converter Ultimate). With it high speed conversion rates and additional feature to enhance your videos easily Wondershare UniConverter (originally Wondershare Video Converter Ultimate) is the best choice for you to convert your MPG to MP4 file formats on Macs. Directly convert MPG to MP4, VOB, AVI, MKV, MOV, and other 1000 formats. Burn videos to DVD disk to play with your DVD player. Zamzar offers a free online video converter that allows you to convert your MPG to MP4 online. You can do this by going to www.zamzar.com . You will need to have the URL or file ready to upload and supply your email address for delivery of the finished file conversion. The free tool is only able to convert files up to 50MB.